This is me (Rachel) and my husband Stephen, wearing our two children, Asa (2 yrs) and Naomi (11 mths). Asa is riding in his well loved Boba carrier and Naomi is riding in her newer Boba 3G Lila. Both have custom made strap covers that I sewed myself. We love our boba carriers and use at least one of them daily. Asa started riding in his boba at 5 months and Naomi has ridden in hers since birth. While the cuddles and closeness of babywearing are nice, we mostly love babywearing because of how practical and convenient it is. 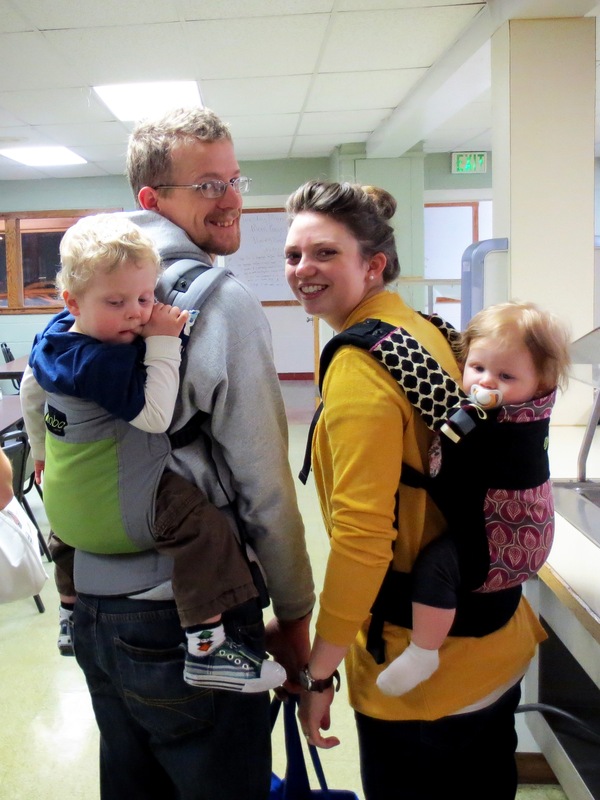 The picture is just another instance of us babywearing around NTBI, where we are living and training to be missionaries. Here all of the students live in one 3-floor building and there are no elevators. We live on the second floor and without babywearing just getting from the car to our apartment would be far more stressful. Also, our kids are only 16 months apart, and babywearing has kept us from “needing” one of those awful, gigantic double strollers. We often travel without a stroller at all and love that we can go anywhere without lugging one with us. Both my husband and I are so glad we were introduced to the world of babywearing before our kids were born. It has made parenting our little ones SO much easier.